This article was originally published on NextBillion. Editor’s note: This is the second part in a four-part series on what the World Bank’s Global Findex reveals about the state of financial inclusion in 2017 and the challenges ahead as many strive for a fully inclusive world. Read the first post in the series: Don’t Throw the Banks Out with the Bathwater: Why the 2017 Findex Shows Opportunity for Microfinance Institutions. Discriminatory policies and cultural norms around property rights, unfair treatment in the job market and an enormous burden of unpaid work are just a few of the disadvantages that make it harder for women to achieve equality with men. On top of these challenges, women are more likely than men to be shut out from financial services, which can be damaging for the hundreds of millions of women with little disposable income. Many organizations supporting microfinance, including FINCA International where I lead Customer Research and Field Data Services, are dedicated to addressing this gender gap by finding more efficient ways of reaching women and delivering financial tools that can improve their lives. With the recent release of the World Bank’s 2017 Global Findex, we are offered a fresh look at women’s financial inclusion. Can financial technologies (“fintech”) help women break the cycle of poverty and financial exclusion? Innovations like mobile money and agency banking promise to dramatically lower transaction costs, while making it possible to extend services far beyond the reach of a traditional bank branch. But is that really happening? Also, how are fintech innovations changing the way women interact with banking services and are these changes narrowing the gender gap in financial inclusion—or making it worse? According to the most recent survey results, women’s financial exclusion is a global phenomenon. Men with access to a bank account (through financial institutions and/or mobile money services) outnumber women by about 200 million. Inequality is somewhat worse in the developing world, where 67 percent of men have access to an account, versus 59 percent of women. Our organization, FINCA International, and the network of 20 community-based microfinance institutions and banks collectively known as FINCA Impact Finance are working at the epicenter of women’s financial inequality. In the countries where we work, the difference in account ownership between men and women is 18 percent—more than double that of the developing world overall. At the regional level, Eurasia is actually a bit less unequal than the world at large, but there are striking disparities elsewhere, especially in Africa and the Middle East and South Asia (MESA) regions. Is the Gender Gap Getting Bigger or Smaller? Mobile money and agency banking services have expanded rapidly in the last few years, especially in sub-Saharan Africa. Comparing the gender gap in 2017 and 2014, however, it is disappointing to observe that inequality hasn’t changed very much, and in some places, it’s even gotten worse. Small variations in Eurasia, Latin America and Africa are within the margin of error. But the MESA region shows a clear and worrying upswing in inequality. In the three FINCA countries—Afghanistan, Pakistan, and Jordan—the gap in the rate of male and female account-holders has increased from 16 percent to 26 percent in just the last three years. During this period, the percentage of men who own accounts has grown from 21 percent in 2014 to 33 percent at present, while women have only grown three points from 5 to 8 percent. A 2016 study generated some exciting headlines: mobile money services in Kenya had reduced poverty, especially for female-headed households, while creating greater occupational choice for women. If other countries want to achieve the same impact from mobile technology, they may need to replicate some of the underlying conditions, starting with widespread adoption of mobile money services among both men and women. As I wrote in a previous article for NextBillion, there are only a few countries in the FINCA Impact Finance network where a significant number of people rely only on mobile banking as their sole source of financial services. Traditional bank accounts are still the norm, with mobile banking being used as an additional service. There are, however, some countries where mobile banking plays an important role in expanding financial access, mostly in Africa, and a few others (like Haiti and Pakistan) where it is emergent. Here, we can compare the gender gap between financial institution and mobile money accounts to see what effect mobile banking services are having on women’s financial inclusion. This graph zooms-in on the gender gap among account holders, not the population at large. As seen at far left, inequality in Kenya is concentrated in financial institution accounts, where there are 18 percent more men than women. But the gap is reversed in mobile money accounts, where women outnumber men by about 22 percent. 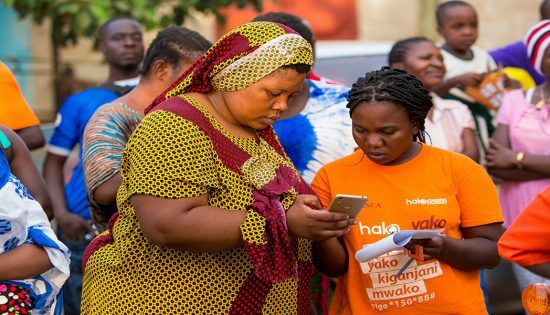 The same holds true in Malawi and Zambia: women’s use of mobile banking services is outpacing men. In these countries, the use-case for mobile banking, which rests heavily on personal transfers and payments, is very relevant for women, who play an active role in managing their family’s finances. As these services grow and evolve, women’s financial equality will improve. Haiti and Pakistan show the opposite tendency. Pakistan is already one of the most financially excluded countries in the world, with a gender gap so big that it needs its own scale. At financial institutions, men outnumber women account holders by 68 percent. And mobile banking, which could theoretically improve women’s financial participation, is not reducing the overall disparity in financial services, as it is in Africa. In fact, the gender gap is slightly higher in mobile banking (78 percent) than in financial institutions. 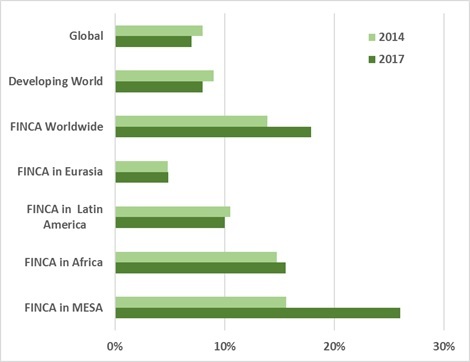 Because the overall representation of mobile banking clients is still very small in Pakistan, this observation is not as statistically strong as it is in Africa. It is, however, consistent with other data, including a recent GSMA report showing that the gender gap in mobile-based internet services is 70 percent in South Asia—the highest in the world. 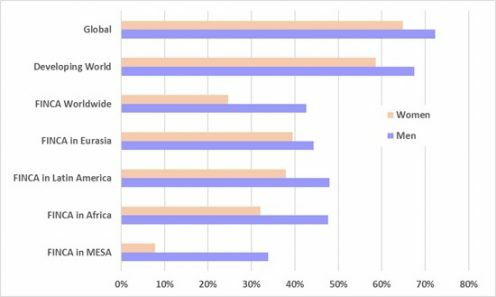 Seen from the demand-side, this gender gap suggests that the use-cases for mobile banking are much less visible for women outside of Africa. It also shows what can happen when technology barriers—like lack of access to a compatible device and data services—are layered on top of the existing obstacles to financial inclusion. Access is not the only issue. Women, who are already struggling with a deficit in financial literacy, now need to gain digital literacy in order to keep up with men. And while mobile services can enhance women’s privacy and security, they are not without downsides, such as exposure to theft and fraud. The cost savings and other benefits of mobile banking can clearly benefit women, as seen in Kenya and other countries in Africa. But we cannot rely on technology alone to close the gender gap. Complementary efforts are needed to ensure that women are connected, engaged and actively benefitting from these services. FINCA and other institutions that are dedicated to women’s inclusion and empowerment can play an important role by designing gender-responsive products and delivery channels and holding themselves accountable for results. Otherwise, the digitization of financial services can become one more obstacle on the road to women’s financial equality.